Rahr & Sons Brewing Co. of Fort Worth has once again been awarded medals at a national competition, this time being recognized for three of its beers at the 2017 North American Beer Awards. 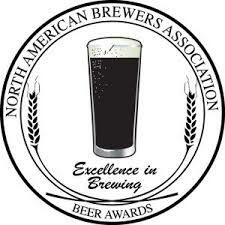 The North American Beer Awards, which is held in conjunction with the Mountain Brewers Beer Fest, is an event put on by the North American Brewers Association. The competition, now in its 21st year, is judged based on style guidelines compiled by the North American Brewers Association Style Advisory Committee. Beers are evaluated in 92 categories by a panel of brewers, certified judges and other industry professionals. Gold for Regulator in the Doppelbock category. Silver for Ugly Pug in the Schwarzbier (Black Beer) category. Silver for Iron Joe in the Coffee Beer category. A full list of winners may be found by clicking here. Cheers and congratulations to Rahr & Sons! Labels: award winning beers, competitions, Fort Worth, North American Beer Awards, Rahr & Sons Brewing Co.